I have been experiencing this body rash for about five months now. I cannot sweat a single drop except from my armpits. 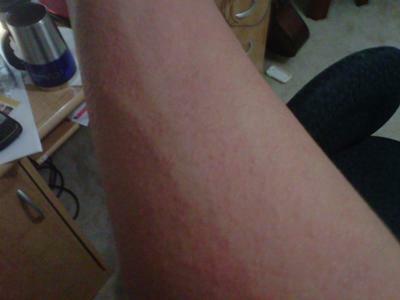 Whenever my body heats up, a rash appears in places that should be sweating. The skin rash feels itchy, but it feels more like a sunburn than itch. My face, armpits, and some other parts of my body that cannot sweat are the only places that are free from this rash. I just arrived here to United States in August 2011. I came from a very humid and hot country where I could sweat quite easily. This type of skin rash first appeared around November 2011 on my back. I recall thinking that the sun was so hot that it burned my back. 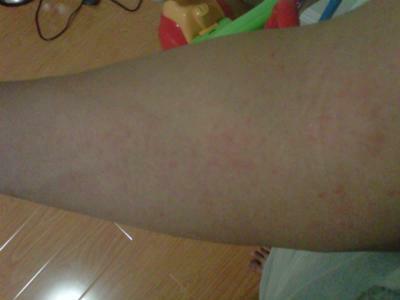 After that the weather got colder and so I didn't realize how and when my rash spread to all over my body. This body rash is so annoying. I cannot exercise because of it and I even have to stop and take shelter under a shaded area when I am walking in hot weather so that I do not get too hot which would prompt the rash to appear. The rash looks like small acne when it first appears. When it gets worse, it looks like tons of mosquito bites in a variety of different sizes on my skin and that makes my skin looks somewhat swollen. I went to a skin disease specialist just to hear him saying: "I cannot help your body to sweat." I hope somebody can help me with my sweat skin rash problem. I have attached two pictures. The first one is when the rash first starts to appear and the second picture is when the rash looks swollen. My mom had this years ago and sometimes she still gets it. They called it prickly heat rash. They gave her an ointment to use when it got bad. Maybe this will help you or anyone else with the same problem. She got it anytime she got hot in sweaty areas. Usually in her armpits or under her breasts and on her stomach. I have this rash on my legs and I am getting really worried. I have had it for over a year now and no doctor can tell me what is wrong.